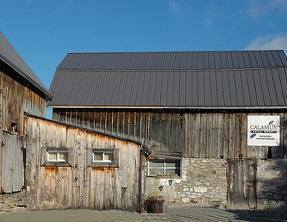 Calamus Estate Winery is a 56 acre property with a historic look and feel. The main facility is a 19th century barn, that has been recently restored and renovated to enhance the winery, while inside is modern winemaking equipment. The property also contains two vineyards that total to 32 acres of vines. The varietals grown in the vineyards are Chardonnay, Riesling, Pinot Gris, Gewurztraminer, Vidal, Cabernet Franc, Cabernet Sauvignon, Merlot, and Pinot Noir. This winery strives on producing fruits to create all the quality VQA Wines located in the Niagara Peninsula. This 14 acre parcel of land was purchased by the estate winery in 1999. The area, located below the Niagara Escarpment, was restored and converted into 10.5 acres of vinifera and hybrid varieties. This 42 acre parcel of land was purchased by the estate winery in 2001. The area, located below the in Vineland and Jordan, was the former site of a dairy farm. After extensive upgrades to the area, 20 acres of vines were planted by 2002 and the final 1.5 acres were planted by 2004. Tasting can be scheduled by appointment or by chance at anytime. All tours and tastings available at the Calamus Winery reqiure an appointment. Please contact the winery directly for more tour information.